Wollaston Township council heard the bad news at their Oct. 13 regular meeting, that zebra mussels have been confirmed this year to be present in Wollaston Lake for the first time. Zebra mussels are an invasive species not indigenous to the area that usually find their was into a lake by being transported in minnow can water or on boat bottoms that have moved from lake to lake carrying the pest. More than a pest, they out compete local species and often significantly transform the bio-diversity of a lake or waterway. Wollaston Lake Home and Cottage Association (WLHCA) lake steward Steve Neville notes that the zebra mussel has been present in the Kawartha Lakes for some time, but this is the first for Wollaston Lake. Just to add insult to injury, spiny water fleas were also found in the lake this year, another invasive species not formerly detected. Neville is retired after 40 years in the environmental business, including work in water quality and river pollution monitoring, and 26 years working at the Ontario Ministry of the Environment. “We are extremely lucky to have him,” said Ireland. Every year a small group of volunteers assist Neville with lake monitoring and testing, and production of the annual “Wollaston Lake: Environmental Health Score Card, a 35 page report which summarizes their initiatives, monitoring programs, including detailed water quality and biological reports with interpretations. Detailed information is available on the WLHCA web site. OWL volunteers (Observers of Wollaston Lake) make their reports in the fall, and for the first time cormorants were spotted on the lake. These birds are not usually seen this far north, so their potential presence will be monitored in future. 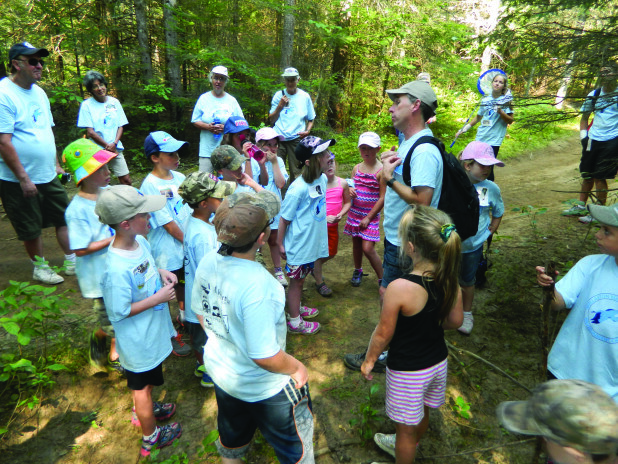 WLHCA also offered the Young Stewards Environmental Camp for youth again this year, and this program has now caught provincial attention. Neville and camp organizer Richard Clark were asked to make a feature presentation to the Annual General Meeting of Federation of Cottage Associations in Toronto on Mar. 7. Their “Inspiring Future Generations: Stewardship in Wollaston Township” presentation covered the vision, planning and outcomes of the local camp, as well as community partnerships created.